Networked with the rest of the world: the University of Münster has an ever-increasing number of international degree programmes and 750 international academics and 3,500 international undergraduate and doctoral students come from 130 countries, characterising the city and university. To further develop internationalisation, the University continues to optimise its international degree programmes, promotes international exchanges for students, academics and staff, and offers students “Internationalisation at Home” courses and workshops, enabling them to gather international experience on-site. With some 44,000 students, the University of Münster offers the complete range of academic opportunities – from bachelor's programmes to in-service continuing education courses. The University values the close relationship between research and teaching, extensive advice and counselling services and high student graduation rates. If you have completed a master's degree programme with above-average marks and are interested in pursuing a doctoral degree, you can find information here about your doctoral options at the University of Münster. The University of Münster is committed to offering excellent research opportunities, high-quality teaching and strong support to its junior researchers. Ensuring equal opportunity for both men and women is also a matter of vital interest. The International Office advises students, academics and staff who are planning a stay abroad or, vice-versa, would like to stay at Münster University. 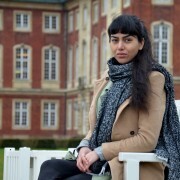 The University of Münster supports young refugees who wish to begin or continue studying in Germany. In addition to our central support services for students and academics, there are several student organisations and faculty events which address the needs of refugee students. Numerous cultural centres and meeting places are available to students and staff of the University of Münster. Not only do they provide advising services, but also a diverse programme of seminars, language courses and events.